NOW TO THE IMPORTANT THINGS. 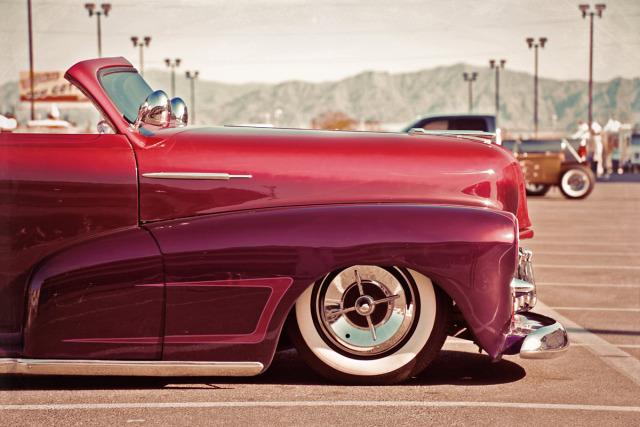 "Flake & Flames is a fantastic adventure through the Kustom Kulture movement around the globe seeking out the hottest Kustom Kulture spots in the United States (US) and Europe. If you are new to Kustom Kulture, you will experience the overwhelming creativity that exists behind terms like Low Brow Art, Hot Rods, Customs, and Pinstriping. Those who are familiar with Kustom Kulture will drool in awe and get a privileged look into the private domain of the Kustom Kulture legends of our time. Some of the world’s best car and motorcycle builders, tattoo artists, pinstripers, custom painters, and pin-up models share their tricks and experience. Artists dedicated to art forms that have traditionally been frowned upon by established society throughout history show you why nothing else can compare." Dirk's and Jesper's "Flake & Flames" is a killer. In my opinion. If you haven't supported Dirk's and Jesper's Flakes & Flames yet, do it. Now. Here's the link. Note to self: Call Dirk and ask him whom he hired to shoot and cut this slick styled video. As this video has far too little scratches, stains, frames and bordes, it can't be made by Mr. Pixeleye himself. Nah. Just kiddin'. It take my hat off to Dirk and Jesper! If you ever wanted to support a piece of art — this is your opportunity. Flakes & Flames by Dirk "The Pixeleye" Behlau and Jesper Bram is a feature length documentary about Kustom Kulture. Because travelling is by far the biggest chunk in their budget, Mr. Pixeleye and Mr. Bram just started a crowd funding. Please visit IndieGoGo for details. The other day Dirk shot me an email with his latest "Flake & Flames"-teaser and asked me if I would like to put it on ralfbecker.com. I hesitated 'cause I knew as soon as the Pixeleye-Maniac releases something new it would be all over the worldwide interwebs. So it wouldn't need my support. I published it on Chromjuwelen.com, but didn't posted it here. But then Dirk released his "Behind The Scenes" video. Which I had to post. Harhar — you fellas rock! Please make sure to visit Jesper's and Maze's websites as well.